Among the California rivers, the Yuba is one of the most dramatic. Draining the Sierra Nevada just north of Lake Tahoe, it is steep and flashy – one of the most flood-prone rivers in the state. Yuba River floods have killed people – notably in 1955, 1986 and 1997 – and climate change is making such floods more likely. As the atmosphere warms, more winter precipitation falls as rain rather than snow. This boosts the amount of runoff coursing downhill in any given storm. The Yuba County Water Agency has been working for years to strengthen levees along the river to handle additional runoff, together with the cities of Marysville and Yuba City downstream. Now the water agency plans something more ambitious: a major modification of New Bullards Bar Dam on the North Yuba River, its primary water storage reservoir, to handle bigger and wetter storms. It plans to build a second spillway at the dam to boost its water-release capacity, at an estimated cost of $160 million. The larger spillway will allow dam operators to release water sooner and faster to prepare for approaching storms. State and federal agencies have undertaken such complex projects, notably at nearby Folsom Dam on the American River, a billion-dollar project recently completed by the U.S. Army Corps of Engineers. But the New Bullards Bar project is a rare example of a local water agency undertaking costly dam modifications in response to changing hydrology. A new spillway would boost the reservoir’s flood-control capacity when warm, wet storms are predicted. Also, the additional operating flexibility it offers could boost water storage at certain times of year, a major benefit to the agency’s agricultural water customers and hydroelectric power generation. New Bullards Bar Dam, completed in 1970, is one of the most spectacular impoundments in the state. A graceful concrete-arch dam, it soars 645ft high over the North Yuba River, providing a storage capacity of about 1 million acre-feet. The existing spillway at the dam has a relatively small release capacity of 19,000 cubic feet per second. Also, it is relatively high on the dam’s face – just 16ft below the typical full-reservoir water surface elevation. This means it can’t release water until the reservoir is nearly full, which limits options when responding to an approaching storm. “With the current spillway, we can’t make big releases because we’re just waiting to fill up the reservoir to the point where you can release lots of water. That’s the point of this new spillway,” Aikens said. The project involves tunneling through the mountainside on the dam’s right abutment. The tunnel would be 38ft wide and 28ft high, with operable gates and a concrete chute directing water into the Yuba River below the dam. It will have a release capacity of 45,000 cubic feet per second – more than double the existing spillway. And it will be 31.5ft lower than the existing spillway gates. As a result, when a big storm is forecast, dam operators can release water a lot sooner to free up empty space in the reservoir. This means the potential impact of downstream flooding is reduced, because the peak flow can be spread out over a longer period of time. Aikens said the new spillway could reduce the flood peak on the Yuba River downstream at Marysville as much as 2ft, significantly reducing stress on the city’s levees. The agency also looked at raising the dam 10ft as an alternative. But that was rejected because it would cost a lot more, cause more environmental impacts and would not improve operational flexibility. The new spillway’s estimated cost of $160 million is about 46 percent less than raising the dam. The South Yuba River Citizens League, an environmental group that has fought for decades to improve flows and habitat in the river, supports the concept of a new spillway, said Rachel Hutchinson, the group’s river science director. She said the project is especially welcome after the disaster at Oroville Dam in 2017. Both spillways at Oroville, operated by the California Department of Water Resources, were severely damaged during heavy storm runoff, forcing thousands of downstream residents to evacuate amid fears the dam itself might collapse. That disaster also churned up gobs of sediment and debris that clogged the riverbed and the Feather River salmon hatchery. A larger spillway would also provide a new kind of drought protection. Normal operations require dam operators to keep lots of empty space in reservoirs during winter to be ready for floodwaters. The greater release capacity of a new spillway could allow the agency to keep the reservoir full more often, providing an important hedge against dry winters. Recent storm patterns in California, for instance, have produced wet conditions in December sufficient to fill many reservoirs. But operators were required to release water to be sure there was room for floodwaters later in winter. But then January and February turned out dry, leaving reservoirs only partially filled by the time winter ended. To take advantage of this winter flexibility, Yuba County Water Agency also plans to adopt a new strategy called forecast-informed reservoir operations. 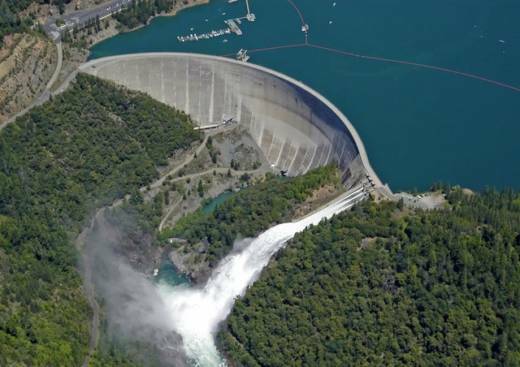 This would change flood-control rules at the dam, allowing the reservoir to be kept nearly full in winter if weather forecasts indicate no storms are approaching. If forecasts show a storm is targeting the Yuba watershed, the agency could still create enough flood-control capacity by dumping water quickly with the new, larger spillway. Aikens said the agency plans to develop the new operating rules while the second spillway is under construction, so both are completed at the same time. Construction is expected to start in 2022, with completion three years later.